With the advent of rummy games going online, rummy apps also have taken center stage to make it big in the world of card games. And counting only from iOS and Android excluding other operating systems like Windows and Symbian, there are around 500+ apps that are into card games, of which 150+ are of rummy or its variants. Gin rummy is the most played, most enjoyed variant of rummy both online and offline. 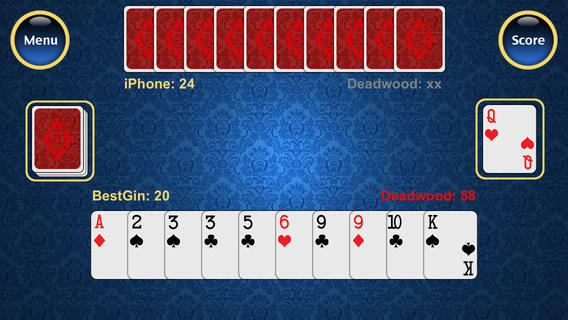 So, we expect to see a lot of rummy apps based on gin rummy in near future too! In this article, we will be reviewing some of the best apps that connect the game of rummy to the smartphone and tablet users around the world. This gin rummy app which is only for Android OS takes the top spot in our app review site all because of the overall rating it has got from more than 2 million players. Only less than 8% players have reported and reviewed with any issue with the app or gameplay. The normal issues reported are the app crash, too much of commercials that exceeds up to 30 seconds and exiting the table while on the game. But still an overall satisfaction of more than 90% is an achievement to boast about. Aces Gin is a well built app that grabs the attention of the players with simple user interface and game mechanics. If you love to play rummy with minimal features, this is the one for you! This rummy app which works only in Android OS and comes in the second spot as reviewed by us and also by other app review sites. The gameplay is fantastic and we should say, because of being seldom or no advertisements, this app attracts more players to itself. As per players, this app only has two disadvantages and one being a very serious one. After declaration, the game might show wrong scores and the second being, the game is very hard to play especially for amateur gamers. Our first iPhone/iPad rummy app gets the 3rd spot in the whole list of card game apps. The pro of this rummy app is the HD graphics that enhances the card game in the retina display of the Apple devices. Another advantage is the fully automated melding, sorting, gin, big gin, knock etc. The rummy app is said to be the best for both amateurs and professionals alike. Some of the cons include poor shuffling and slow gameplay. Hope you liked reading about the top 3 apps that rule the smartphones and tablets in card game category, especially rummy. Also read our weekly rankings on top card games in category Rummy Apps. Got a review/suggestion/comment to share? Post it in the comment section below.